Scooby-Doo has been one of my favorite cartoons since childhood, and I frequently buy the comic for my kids. 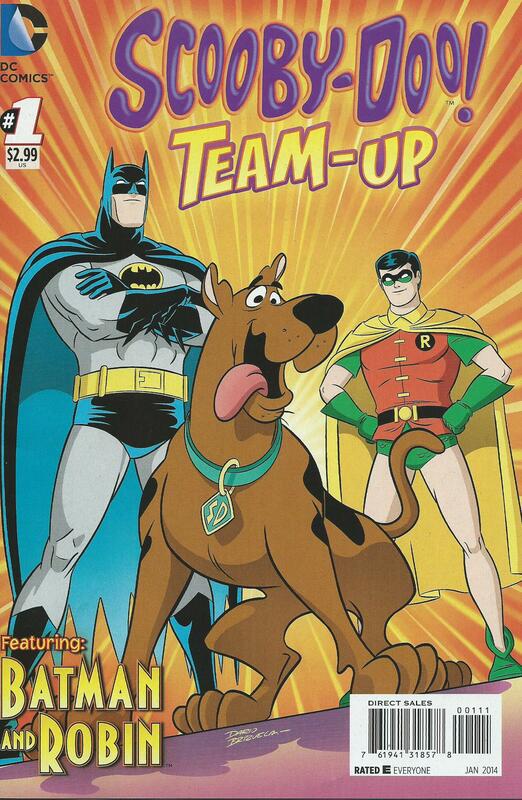 When I learned the gang would be teaming-up with Batman and Robin in the debut issue, by DC Comics, I quickly thought of their team-up in the cartoon years ago. Daphne even mentions their run-in with the dynamic duo in this issue. Scooby-Doo and the gang are on a hunt for a giant, flying bat-looking creature, when they run into Batman and Robin, who are already on its’ trail. They learn from the dynamic duo that the half-man, half-bat is Man-Bat. He is extremely dangerous because he’s more animal than human, when in bat form. Meanwhile, the gang foils a robbery attempt by three Man-Bat imposters. In their attempt to capture a fourth imposter, the gang and the dynamic duo quickly realizes it’s the real Man-Bat. Batman and Robin have ONE vial of antidote, meaning they only have ONE shot at Man-Bat to administer it successfully. This all-ages, easy-to-follow story was written by Sholly Fisch. Funny dialogue and character interactions. I especially liked how Robin checked Freddy for using his catchphrase! Great artwork by Dario Brizuela. Definitely no complaints in this area. Original looking characters that I’ve loved since childhood. I plan to buy future issues of this title for my kids, and myself of course. You can never go wrong with Scooby-Doo, one of the most beloved cartoon characters. I highly recommend this title, especially for those with young children. It’s perfect for storytime.